Franklin, Indiana is the county seat of Johnson County. It was platted in 1823, and the first post office was opened in 1824. This historic city is approximately 20 miles south of Indianapolis and has approximately 25,000 people. Franklin College was founded in 1834, and the historic college that sits on a 207-acre campus is still going strong today. Nature lovers will be delighted with the Blue Heron Park and Wetland. Boasting 55 acres of beautiful landscape that includes open fields for sporting activities, walking trails and some 12 acres of wildflowers to observe, this a popular place for outdoor lovers. Inside of Province Park, you’ll find the Franklin Action Park, designed for skaters and BMX bikers, a definite extreme sports destination. The Franklin Cultural Arts and Recreation Center includes Beeson hall, a rental space that holds up to 400 people. The Center also includes the Arvin Activity Room, used for meetings and various events. There is also a full gymnasium to be used for basketball and volleyball. The fun doesn’t end there. There are racquetball courts, a climbing wall and track for running and walking and a theater and stage area. If you enjoy classic films, the renovated Artcraft Theatre, opened first in 1922, offers not only classic films, but hosts festivals and events. Real estate in this historic town is a combination of old and new. You will find Victorian-style homes, ranch homes and bungalows in established neighborhoods with mature trees and nice yards. You’ll also find newer more contemporary homes as the community grows. This town is rich in history, and the downtown district has traditional shops, restaurants and coffee shops. It is known for its many trails for quiet walks, and the activities geared toward college students. Because of its location, several large companies have located offices there, and the town has a forward-thinking attitude. 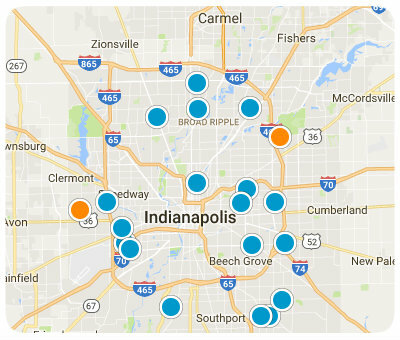 With all its positive aspects, as well as its proximity to Indianapolis, this is a must-see destination for home buyers searching in the Indianapolis area. If you would like more information on homes for sale in Franklin, Indiana, please contact us today and allow us to assist you.